OSPF it a protocol of itself. What do I mean by that? Well, you know TCP and UDP. Those are well-known protocols used for communication by a lot of applications. Similarly OSPF is a protocol riding directly on top of IP. It has IP protocol number 89. EIGRP is also a protocol of itself, but BGP for example is not. Advertises /32 regardless of configured subnet mask! It is the interface encapsulation that dictates which network type is the default. This is the way I remember which ones need a unicast neighbor configuration. And by the way, you only need to configure the neighbor in one side – the other will respond and they establish an adjacency. The Loopback advertising /32 regardless of subnet mask is easily fixed. Just change the network type to point-to-point on the Loopback interface, and the configured subnet mask is advertised. Note I didn’t need to turn on debugging to see this – just logging (warning level). And also note that you’ll only see this output on the router that does not have a DR-based network configuration. Why is this? Well, since it has a network type that will not elect a DR, it will not expect a Type 2 LSA to be originated by the adjacent router on this interface. This is how it knows something is wrong. You can also see the issue in the router LSA of the neighbor on the router configured for P2P. Here it is telling us that Adv Router is not reachable in the topology. For DR-based network types, you only become adjacent with the DR and BDR – the DROTHER routers you’ll only become neighbors with (we see each other’s RIDs – 2WAY). Here the received ® mask is 255.255.255.192 and our configured © mask is 255.255.255.0. The adjacency will not form! You will not even see the neighbor in the neighbor table! The reason for this is that with broadcast and non-broadcast it is expected that more than two routers will become neighbors and therefore they should share a common subnet. This is because R2 was previously configured for non-broadcast and still has the neighbor statement under the OSPF process. The normal area is just enabling OSPF on an interface without further configuration. With stub area types – either stub or NSSA – we always block LSA Type 5 and therefore also LSA Type 4. So you’ll never see O E1 or O E2 in the routing table of an internal OSPF router in a stub area – regardless of stub area type. Let’s have a look at the differences between stub and NSSA. Firstly let’s look at the requirements of a stub area. Right now R1 and R2 are configured for Area 0 on their Gi1.12 link and are adjacent. I’ve also added some Loopback interfaces to inject some prefixes into the topology. And I’ve configured � area 23 as a normal area between R2 and R3. The adjacency to R3 goes down immediately as area has been turned in to a stub area. Why is that? Let’s debug and also do a capture of the Hello packets. There is no actual “stub” flag per say, but like I wrote earlier about stub areas is that they are not capable of containing external information (Type 4/5 LSAs). This is why we see the (E) External Routing bit set to 0 (meaning Not capable). This hello packet is generated by R2 – R3 still tries to create a neighborship thinking area 23 is a normal area. 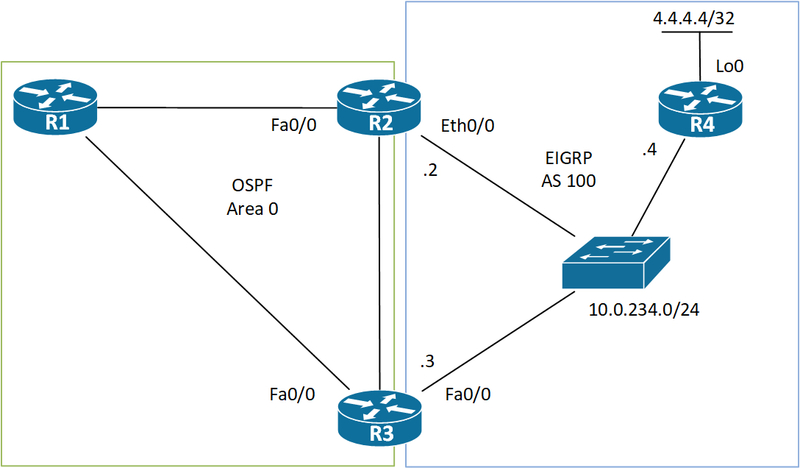 So if Type 4/5 LSAs are blocked, how do we reach destinations external to our OSPF domain? Let’s have a look. Again we see what we expected. R2 (Advertising Router: 2.2.2.2) did inject the default route making area 23 able to reach external destinations. LSA Type 4/5 area blocked by the ABR. The ABR injects a LSA Type 3 default route into the stub area. Just the one default route exists now. This makes area 23 very efficient in terms of resources. As you can see, I’ve configured the link between the two ABRs in area 0 and the link between R4 and R3 in area 23 – the stub area. Also I’ve added a link between R1 and R4 for redundancy purposes. Provides load sharing of traffic exiting area 23. The first purpose if obvious. Two routers providing reachability to area 23 gives us redundancy. If one ABR goes down, we can still use the other. The next benefit of this design is that when R3 wants to send traffic to destinations internal to our OSPF domain, we’ll transit R4, because routers use the longest match routing decision. Now we see that R3 is no longer using ECMP, but only uses one path for the default route (via R2). In the LSDB we see why. The Metric: 44 is set on the 0.0.0.0 Summary LSA from R4 making it less desirable. What we’ve essentially done now is configured traffic engineering for area 23. As expected we see a bit set for the NSSA feature. Also notice that we’re still not allowing External Routing leaving the E bit unset (0), because this is a type of stub area! We see it as an O N2 route (NSSA External Type 2). The reason is that although we’re not allowed to flood external route information into a stub area – be it stub or nssa – we are still allowed to redistribute other routing domains (or just connected interfaces) into a NSSA. The trick is that OSPF uses a LSA Type 7 (nssa-external). I’ve actually also redistributed R5’s Lo0 into the NSSA, too. Sure we only see the inter-area prefixes in the routing table. Notice that we do not have a inter-area default route as we did with the stub area! This is expected in a NSSA. I’ll show the options for doing this a bit later. And the LSDB? We only see the redistributed Lo0 of R5 – nothing from R1! Say we’d like communication between R3’s Lo0 and R5’s Lo0. Right now, because the NSSA has no route to R3’s Lo0 prefix, 3.3.3.3/32, no communication is possible. R3 will have a route to R5’s prefix, because R1 being an ABR, will actually translate the Type 7 LSAs into Type 5 LSAs. This is because the Type 7 LSAs are are local LSAs, meaning they are not allowed to leave the NSSA. Using NSSA with the LSA Type 7 default route is referred to as NSSA Stub. And the NSSA with the LSA Type 3 default route (filtering all other LSA Type 3) is called Totally NSSA. The forward address of Type 5 and Type 7 LSAs is used to provide optimal routing to external prefixes. If all of these criteria are present, the ASBR can set the FA to the next hop IP address of the route. This means that the FA in this case will be set to 10.0.234.4. Back to the cost issue of this next hop. Because we have enabled OSPF on R2’s Eth0/0 and R3’s Fa0/0 link, R1 knows the cost of both ASBR’s links towards the next hop and is able to use this cost in its FM (Forward Metric). To avoid redundant information, just one of the ASBRs will originate the Type 5 LSA for the external prefix. This is why the interfaces must not be passive – we need an adjacency to be able to tell which router should generate the external LSAs. The router with the highest RID wins and generates the Type 5 LSAs – R3 in this case. Enough theory, let’s jump to the CLI and have a look under the hood. We’ll start by looking at the path R1 chooses to reach 4.4.4.4/32. Please note that I am demonstrating this inside “VRF a”, but the same theory applies regardless of VRFs. Just the one LSA originated by R3! Just as predicted and dictated by the theory. Note the FA is set to 10.0.234.4 as we also expected. If we somehow filter 10.0.234.0/24 from being advertised into Area 0, R1 will not be able to install the route to 4.4.4.4/32. It will still have it in its LSDB, though, but with no intra-area or inter-area route to the FA, the router cannot calculate the FM which invalidates the external routing information and the prefix is removed from the routing table. This is also true if you somehow learned the FA as an OSPF external route. 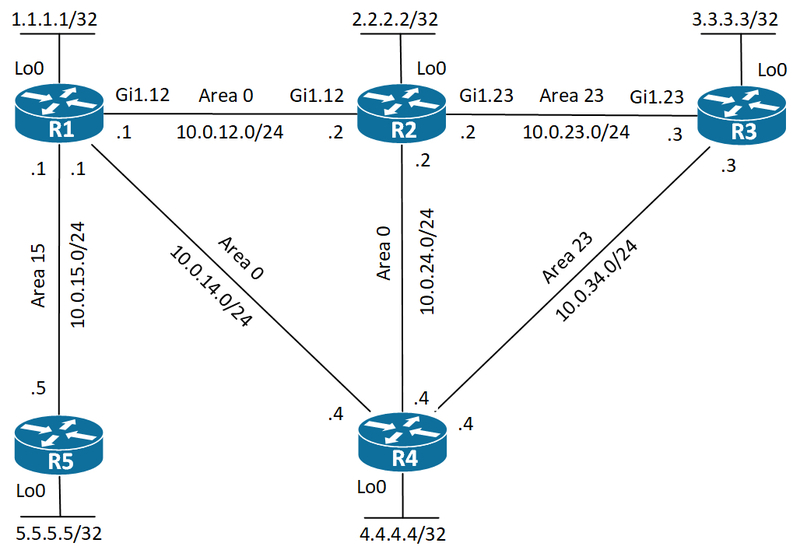 OSPF requires a strict two level hierarchy where every area must connect to area 0, the backbone area. If either area 0 gets partitioned, or somehow an area is attached behind a non-backbone area, this requirement of two levels is broken. To repair the issue, you can use a VL (virtual link). What is the function of a VL? It allows the router that has an area behind the non-backbone area to have an interface in area 0 thereby restoring the requirement of two levels. If we look at this OSPF network, we quickly see that something is wrong. The area design is invalid, because area 34 is not connected to area 0. The problem is that R3 borders between area 23 and area 34. 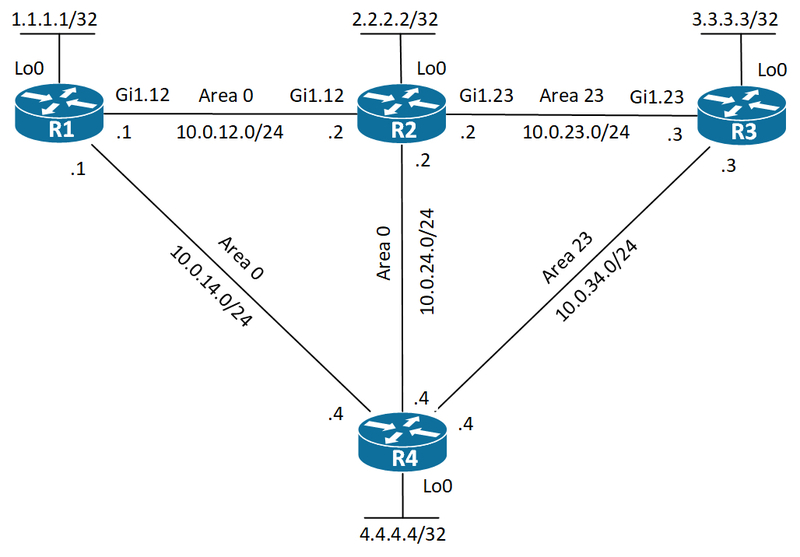 In OSPF an ABR is a router that connects to area 0 and a non-backbone area. R3 lacks this requirement of connecting to area 0. We can fix this by creating a VL between R2 and R3. To see the problem, we can look at the routing table of R2. It should not have a route to 4.4.4.4/32, but R3 does. Looking at R4 it should have an intra-area route to 4.4.4.4/32. You might think that with a unicast P2P adjacency a neighbor configuration is needed. This is not the case. If this was true, which IP address should you then use? And if that link goes down? OSPF has no concept of an update-source like BGP does. The best thing is to let OSPF figure it our by itself. Because the two routers are in the same area (they must be), they’ll know about the other routers Type 1 LSA. In here they find a stub network that they can use as the destination. This is what the routers will use to reach each other. Now let’s have a look at the config. So to establish this area 0 adjacency with R2 (2.2.2.2), look for the Type 1 LSA in area 12. On R2 the configuration is identical, but uses the router-id of R3 (3.3.3.3). First of all we see the usual Hello packets letting the routers present themselves to each other. Next they verify that they have seen each other by listing the Active Neighbor in the Hello packet. They both do that. Now the sync of the LSDB can happen and the adjacency is eventually FULL. Now we see an inter-area route to 4.4.4.4/32, because R3 now can act as an ABR having an interface in area 0 and another in a non-backbone area (34 in this case). Below is a simple topology to go through what a sham link is and why you might want to use it. Let’s say that the customer above has a backdoor link between R3 and R4. Perhaps the customer decided to buy a cheap connection for redundancy purposes. Whatever the reason, if this backdoor link is a very slow speed link that the customer only wants to utilize when the link to one of the PE routers goes down, we might have to help with correcting the routing issues for the customer. Routing issues? Take a look at the topology. The customer runs OSPF in area 0 between his routers. OSPF always prefers intra-area routes over inter-area router. And Inter-area routers are preferred over external routes. In this case the prefixes are learned as intra-area, because the customer does not do multi-area OSPF. So far so good – or bad. It turns out that when you run OSPF as a PE-CE routing protocol, the best you can do with the default behavior is sending inter-area prefixes to the customer. Why inter-area? Because the MPLS backbone of the SP acts as a superbackbone area to OSPF, meaning a level higher than area 0. This actually causes the PE routers to become ABRs and they will generate Type 3 LSAs for the prefixes redistributed from BGP into OSPF. There is a catch. The PE routers will only generate Type 3 LSAs if the Domain ID of the BGP prefix matches with the OSPF process for the customer. If the OSPF process ID differs between the two PE routers, they will generate Type 5 LSAs instead! This means that the customer will use its bad link between R3 and R4, because O is better than O IA. But we can help the customer. The tool we need is called a sham link. Let’s have a look at it. So R3 is using the link to R4 to reach R4’s Lo0. This is not what the customer wanted. Let’s have a look at the sham link that will solve the problem. Focusing on the OSPF part of the above topology, let’s have a look at the configuration of one of the PEs. The first thing that must be done is creating a new interface in the customer VRF. This will be used as the unicast source and destination of the sham link. 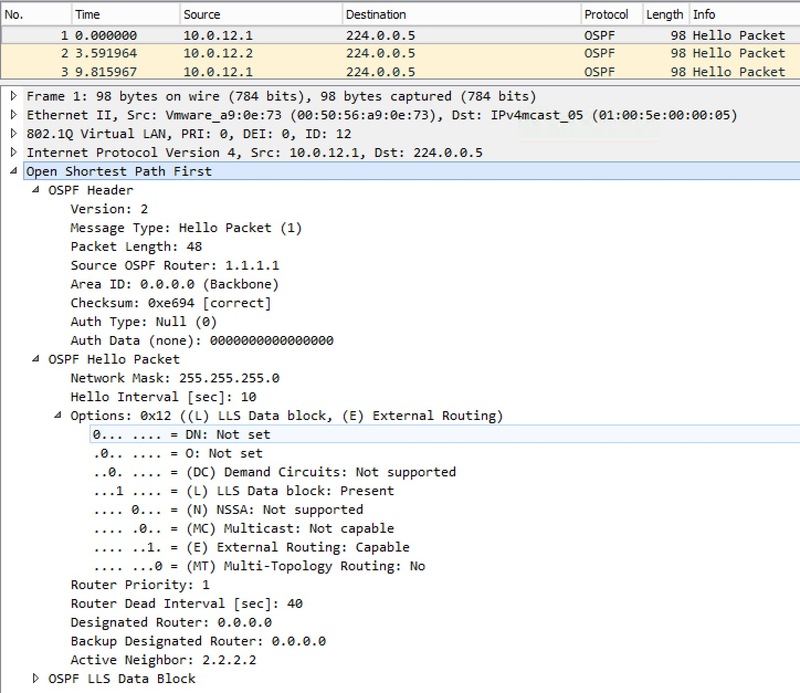 You must� not� advertise this into OSPF – only into BGP! Next the sham link is configured in area 0 and you’re done. Verification is next. It’s using R1 as the next hop. Problem solved! Note that this was only solved, because of the metric of the route to reach 4.4.4.4/32. Given that the link the customer bought between R3 and R4 was a slow link, the cost should be higher. So either the customer changed the bandwidth configuration of the interface, or configured an OSPF cost on the interface. Both should be done. In the above the metric before the sham link was configured was 101. After the sham link had been configured the cost is now 4 (the default cost of a sham link is 1). Here we’re using OSPF as a PE-CE routing protocol. The domain tag is used and set by the PE routers to prevent loops for Type 5 and Type 7 LSAs, because these LSAs are the only ones capable of carrying a tag. It is set upon redistributing between MP-BGP and OSPF. The domain tag is a 32-bit number where the least significant 16 bits represents the ASN of the PE. � Note the PE router will only generate external LSAs when the OSPF Domain ID does not match in the VPNv4 prefix. The Domain ID is the OSPF process ID carried as an extended community in the VPNv4 update. Since we’re using AS 12, we see that the 16 least significant bits (00000000 00001100) also equals 12. Therefore the tag equals our AS and the route must be looped (advertised by one of our other PEs). 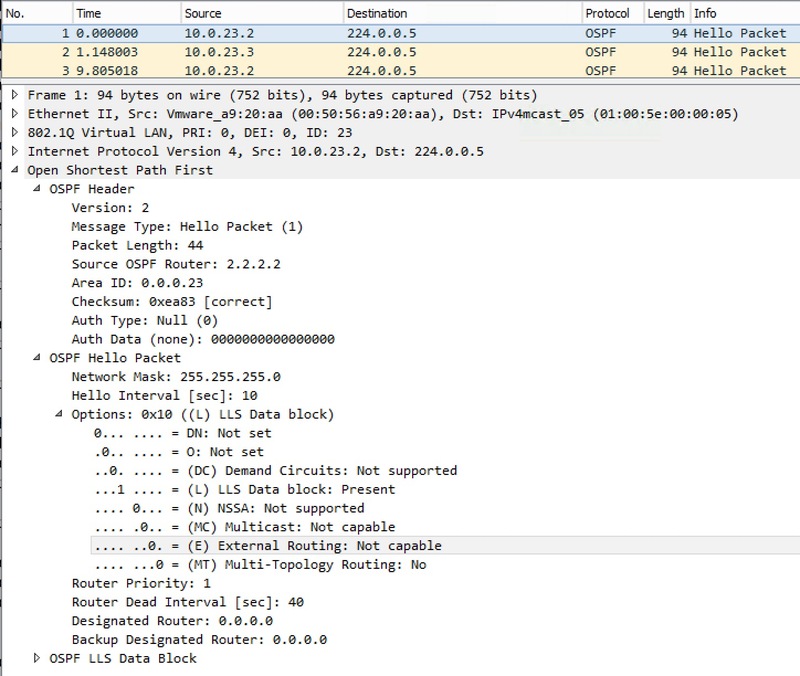 OSPF uses the DN (Down) bit when a PE router advertises Type 3, 5, and 7 LSAs after redistribution of MP-BGP to OSPF. Like the Domain Tag� the DN bit is used as a loop prevention in OSPF and tells the PE router to not use this LSA in the OSPF route calculation. So the PE router will essentially ignore any LSA that has the DN bit set thereby not redistributing the prefix back into MP-BGP causing a loop. The Downward option you see of each LSA is the DN bit. With this set, the LSA is ignored when running SPF. This tells R3 to ignore the DN bit when calculating routes, because now it knows it is not connected to a MPLS VPN Superbackbone. According to RFC 4477 Section 4.2.3� a PE router that has a link in a non-backbone area (like area 12 above) functions as an ABR. And since the OSPF backbone always contains all � ABRs, the PE is considered an area 0 router. This causes area 0 to be dis-contiguous in the topology above. 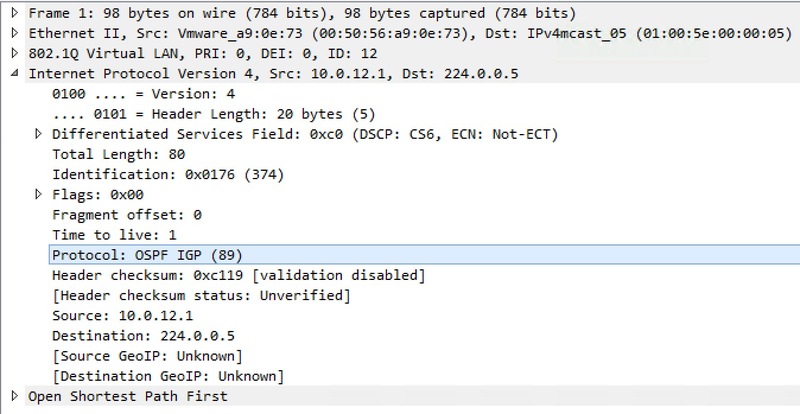 The fix would be to create a VL (Virtual Link) between the PE and CE routers. Remember that a VL is always part of area 0! Another option exist. Whenever OSFP is run inside a VRF, the router automatically assumes it is part of the Super backbone which makes it an ABR and ASBR. We can disable this assumption by configuring the� capability vrf-lite� feature under the OSPF process of the PE router. I would not recommend this, though, because it disables setting the Down bit and the Domain Tag when originating LSAs to the CE – important loop prevention techniques. You can run area 0 between the PE and CE. 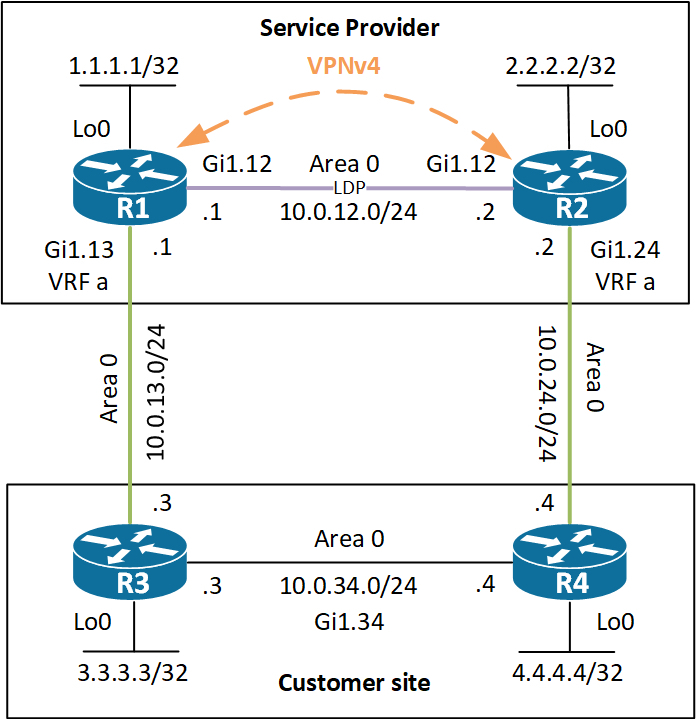 The PE will still consider itself as part of the Super backbone because OSPF is configured for a VRF. Now you have no problems with inter-area routes not being installed on the PE, because they are received in area 0, and according to RFC 2328 “Inter-area routes are not� summarized to the backbone. This is because inter-area routes are� always associated with the backbone area”. Remember the PE is an ABR connecting to the Super backbone – a level higher than area 0. Here area 12 is stretched to� all� routers of the customer. This is a valid design. The PE acting as an ABR/ASBR can safely inject Type-3 LSAs into area 12. In short we can conclude that a non-backbone router will use a Type-3 LSA� only if it is not an ABR itself. This also confirms the strict two level hierarchy of OSPF – or star formation of areas if you will (area 0 being the center of the star). Used to cut down on the size of the LSDB and routing table by filtering out transit links. It is enabled with just one command either at the process level or interface level. You could see the prefix suppression as a security mechanism, because when enabled you do not attract traffic to the transit routers as you do not have reachability information for these.